November 7, 2010 - A local aviation company and its chief executive officer have been charged with violating the Arms Export Control Act, following a joint investigation by the U.S. Immigration and Customs Enforcement (ICE) Office of Homeland Security Investigations (HSI), the FBI and the Defense Criminal Investigation Service. Floyd Stilwell, 84, and his company, Marsh Aviation, of Mesa, Arizona, are charged in an indictment unsealed October 27 with illegally exporting military aircraft engines from the United States to Venezuela for use by the Venezuelan Air Force. The T-76 engines are a designated item on the U.S. Munitions List, which under the Arms Export Control Act, makes it illegal for these engines to be exported without a license or written authorization from the Department of State. 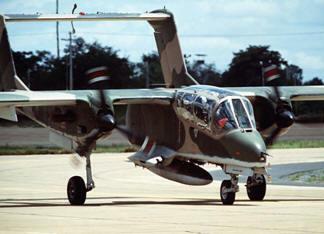 The T-76 aircraft engine was designed for the OV-10 Bronco Aircraft, a light armed reconnaissance aircraft specifically suited for counter-insurgency missions. Federal agents executed a search warrant on February 5, 2008 at Marsh Aviation offices where they discovered two complete T-76 engines and enough component parts to construct 12 additional engines. The indictment also alleges that without having obtained the necessary license or written authorization from the Department of State, Stilwell and Marsh Aviation Company furnished assistance to members of the Venezuelan Air Force, including testing, repair, maintenance, modification, operation, and using the T-76 military aircraft engine, and training in the assembly. "Our investigation showed that the defendants in this case falsely claimed these engines were parts for civilian aircraft in an attempt to circumvent the law," said Matt Allen, special agent in charge of ICE HSI in Arizona. "The enforcement of arms export controls keeps America safe. One of HSI's top enforcement priorities is preventing military equipment and sensitive technology from falling into the hands of those who might seek to harm America or its allies." Marsh Aviation is an aircraft rebuilder established at Mesa, Arizona in the mid 1970s to convert piston-powered aircraft to turboprop power. The company's first projects involved fitting Rockwell Thrush Commander agricultural aircraft with Garrett AiResearch TPE-331 engines. Later, the firm also re-engined Gulfsteam Turbo Cats, Beech Turbo Mentors and Grumman S-2 Trackers with Garrett engines. The Venezuelan Air Force has operated a number of new build OV-10Es and ex-USAF OV-10As over the years. On 27 November 1992, the aircraft were widely used by mutinied officers who staged an attempted coup d'?tat against former President Carlos Andr?s P?rez. The rebels dropped bombs and launched rockets against Police and government buildings in Caracas. Four Broncos were lost during the uprising, including two shot down by a loyalist F-16 Falcon.